Remarks like these create a false hope in Ankara. Turkish officials believe that relations with Washington would be improving, were it not for a number of American bureaucrats who are remnants of the Obama administration. Ankara has long blamed Brett McGurk, Special Presidential Envoy for the Global Coalition to Counter ISIS, for America’s partnership with the Syrian Kurdish militia, the People’s Protection Units, which Turkey considers a terrorist organization. Now the Turks are blaming U.S. ambassador John Bass for the current feud. What the Turkish government fails to understand is that there is now bipartisan consensus on the deep-seated structural problems with Turkey. Even at the Pentagon, which has historically promoted good relations with NATO’s second largest military, there is little sympathy for Erdogan’s Turkey. The recent spat is the latest in a long-running mistrust that has been building over divergent interests and Erdogan’s widening purge at home after an attempted coup last year. The realism of both the Obama and Trump administrations sought to turn a blind eye to the drift in values between the two countries for the sake of common interests. 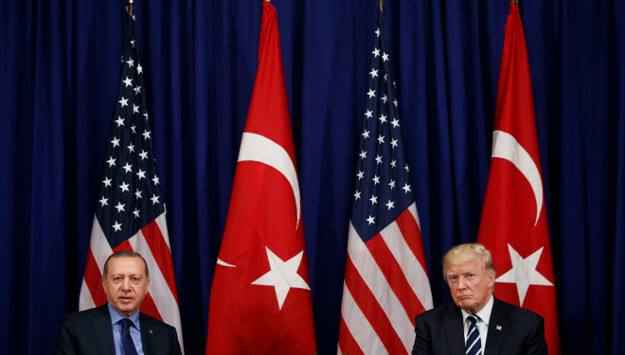 But in the face of diverging interests, Turkey’s authoritarian turn has become much less tolerable in Washington, even for a supposedly friendly White House. The al-Qaeda-linked Hay’at Tahrir al-Sham (H.T.S.) is carefully weighing its options after Turkish troops entered Idlib over the weekend. The Turkish operation comes as part of an agreement reached between Turkey, Iran, and Russia in the sixth round of the Astana talks last month. The Turkish army will establish checkpoints in Idlib, and the fight will be spearheaded by Turkish-backed Syrian rebel groups. Russia will also play a role in this operation by providing air cover and deploying its forces on the southern borders of the province. Turkey has two major goals in this operation: first, to push H.T.S. away from Turkey’s borders; and second, to isolate Kurdish forces in Afrin. H.T.S. perceives this operation as an existential threat. The Turkish presence will undermine their strength and prop up Turkish-backed rebel groups in the area. While neither Turkish forces nor H.T.S. are keen to enter into a direct confrontation, clashes may be inevitable. On the one hand, H.T.S. cannot restrain all its forces from attacking the Turks or their groups. On the other hand, Turkish-backed Syrian groups might feel the penchant for revenge against H.T.S. after suffering attacks from the al-Qaeda-linked group over the past three years. The next few days will be crucial. The scale of the operation, the points where Turkey will position its forces, and H.T.S.’ reaction on the ground, will shape the next battle in Idlib. The ministerial water commission set up by the Moroccan government last week to lay out a national water security strategy is an important step forward, provided that all the components of viable water policies are put in place to support the eventual strategy’s implementation. In the early 2000s, Morocco was one of three MENA countries where almost three quarters of the region’s freshwater supply flowed. Morocco’s per capita water availability was slightly short of the minimum necessary for sustainable development. This has changed since, and the longer-term picture is of concern. Morocco’s water demand is projected to continue to rise through 2050 while supplies will be steadily decreasing. Morocco’s mixed economy, which depends significantly on agriculture, can do better with changes in water utilization patterns: agriculture employs a third of the population, claims nearly 90 percent of the country’s total freshwater withdrawals, yet produces slightly over one tenth of its G.D.P. This imbalance is unsustainable and unhealthy for water and food security. Morocco is vulnerable to climate change because of the exposure of its coastline to rises in sea level, and its agricultural production’s considerable dependency on rainfall. Climate change is projected to continue to lead to more frequent and longer heat waves and droughts in MENA. That this water commission has been established before Morocco reaches water poverty, and crisis, is a welcome development. There is still some room now to implement reasonable adaptation strategies before pressures on the government and population become too great. After a week of consultations at home, representatives of Libya’s House of Representatives (HoR) and State Council are scheduled to return to Tunis as soon as this week for further talks to amend the Libya Political Agreement. At issue are whether the two sides participating in the Joint Drafting Committee can agree on a smaller and more functional Presidency Council, with enhanced authority for a separate prime minister, and a formula for Libyan security that resolves the thorny issues about civilian oversight of the military and the role of General Khalifa Hifter. Salamé spent last week undertaking shuttle diplomacy, meeting variously with Libyan Prime Minister Fayez al-Serraj, State Council head Abdulrahman Swehli, Libyan National Army chief Hiftar, and HoR speaker Aguila Saleh, and emerged with reported optimism. The challenges remain enormous, but the hopes for progress are also real.